Muriel McAuley, left, with her daughter Michelle. We are both pleased and honored to present to our guests at this years Irish Gathering Muriel McAuley, granddaughter of Thomas MacDonagh, 1916 Easter Rising Leader. 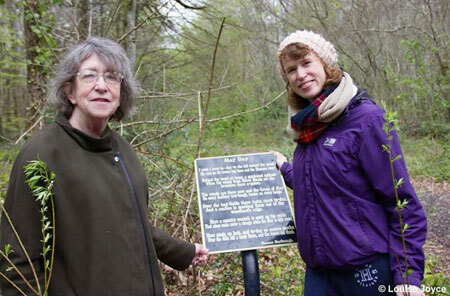 She continues her grandfather's legacy to this day with her devout commitment to Ireland's freedom and protection of historical sites from the 1916 Rising. Thomas MacDonagh was born in Cloughjordan where his parents were teachers. After his father’s death, he went to Rockwell College. He considered becoming a priest, and taught in Rockwell, but changed his mind before he went to their novitiate and moved to Kilkenny. 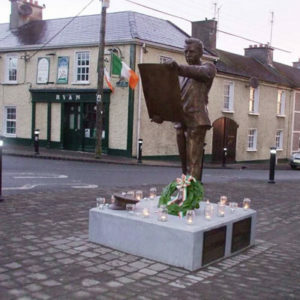 It was there he attended a meeting of Conradh na Gaeilge (Irish League) and became interested in Irish culture and nationalism. In the Aran Islands, he met Padraig Pearse and when Pearse opened St. Enda’s school, MacDonagh became second in command. From then he joined and became heavily involved with the Volunteers when it was founded. He was a lecturer in English at UCD when he married Muriel Gifford in January 1912. They had two children, Don and Barbara. He was a signatory of the Proclamation and commandant in Jacob’s during the Rising and was executed on the 3rd of May 191. 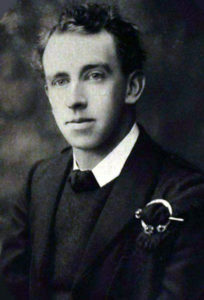 After the Rising and the execution of the leaders which included Thomas MacDonagh his widow, Muriel, was left with two small children, Donagh (aged 3) and Barbara (aged 1). In the course of the following year, she participated in fundraising to help the families of those who had died or been jailed and, when they were released, those who had been imprisoned. This included having photographs taken with the children for fundraising publicity. In July 1917, she was persuaded to join the other widows and their children on holiday in Skerries. After two RIC men removed a tricolour they had erected on the beach (which her sister retrieved), she decided to swim to Shennick Island to hoist it there. She tried one day, but turned back, but said she would try again. On 9th July whilst swimming, she was caught in a strong current and swept out to sea. According to the autopsy, she did not drown but her heart gave out. Huge numbers of people from all over the country attended her funeral. Muriel McAuley was born on the anniversary of that funeral and was named for her. Thomas MacDonagh and Muriel Gifford were her grandparents. This May 3rd, 2018 marks 102 years since the death of 1916 Easter Rising Leader Thomas MacDonagh, a teacher and intense nationalist among the 15 men court-marshaled by the British for their role in the Rising’s organization and operation. Watch for updates on what’s happening at the Gathering. Meanwhile, LIKE us on Facebook for further information and start making plans to attend.